Balkans & Beyond, Days 10-13: Bratislava, Slovakia to Budapest, Hungary. After packing up and leaving our Airbnb apartment in Bratislava on Wednesday, we turned to the Taxify app again to book a ride back to the city's central train station. 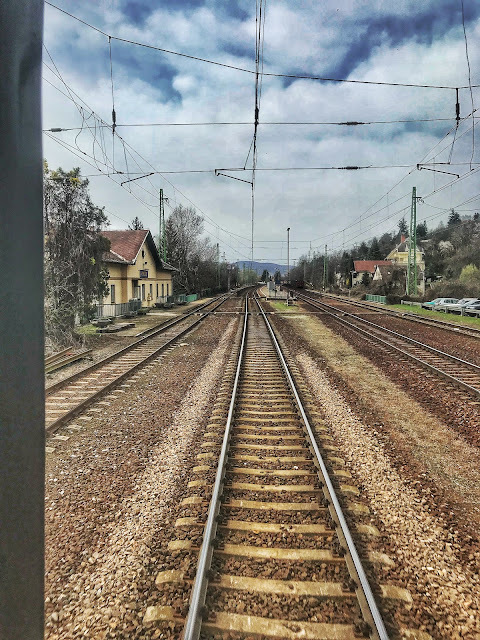 Like the ride from Vienna to Bratislava, the train trip to Budapest—about 2.5 hours—was pretty uneventful in terms of scenery and the journey itself. 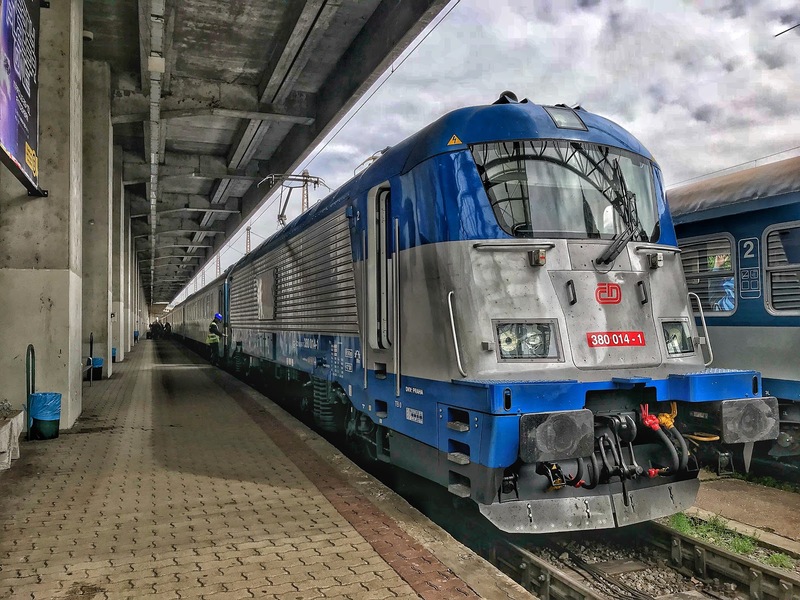 We were reminded, however, how relaxing rail travel can be: no security screenings, liquid bans, navigation on unfamiliar roads. 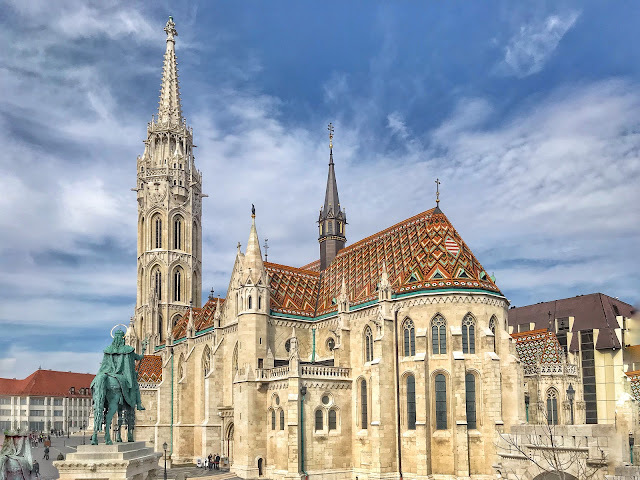 In addition, a Bratislava to Budapest train departs every hour, and our ticket was good for any one of them, no reservation required. To seal the deal, the tickets were only about $30 each. 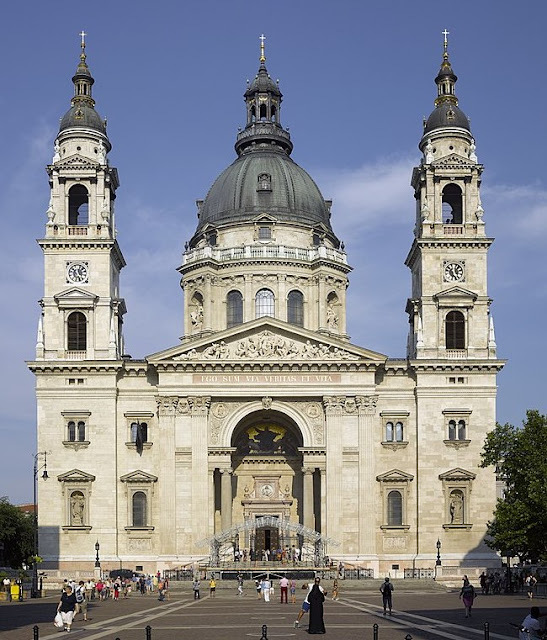 This would be our second visit to Budapest, the first occurring in 1985. At that time, Hungary was still under Communist rule (until 1989), and what we remember most about our earlier visit was how inexpensive food and transportation were and the air of melancholy we observed in the city. As people went about their business, we saw no lively interaction, no zest for their activities. We expected to find a city much changed in the almost 30 years since the fall of Communism. 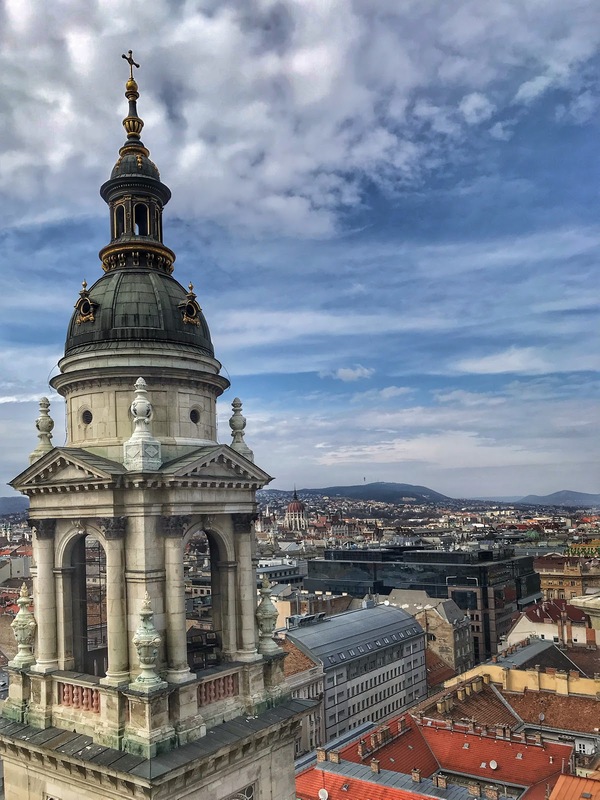 Though its component parts date back to the years before the second millennium, the city of Budapest was not founded until 1873. 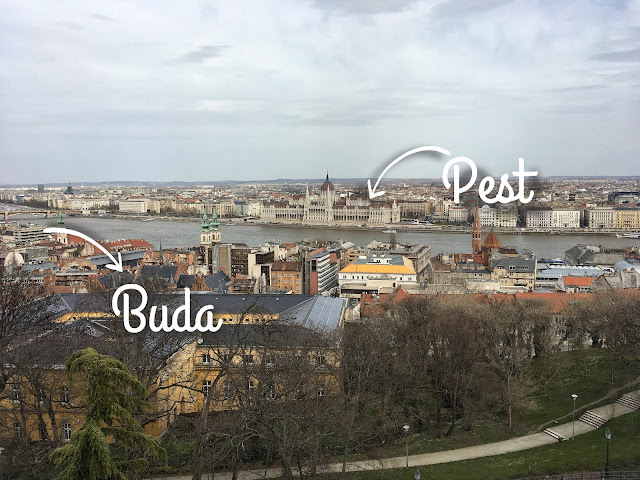 At that time, the neighboring cities of Buda on the west bank of the Danube River and Pest on the east side merged to form Budapest. Back in the 800s when this part of Europe was under control of Bulgaria, Buda and Pest were established as frontier fortresses on opposite sides of the Danube. 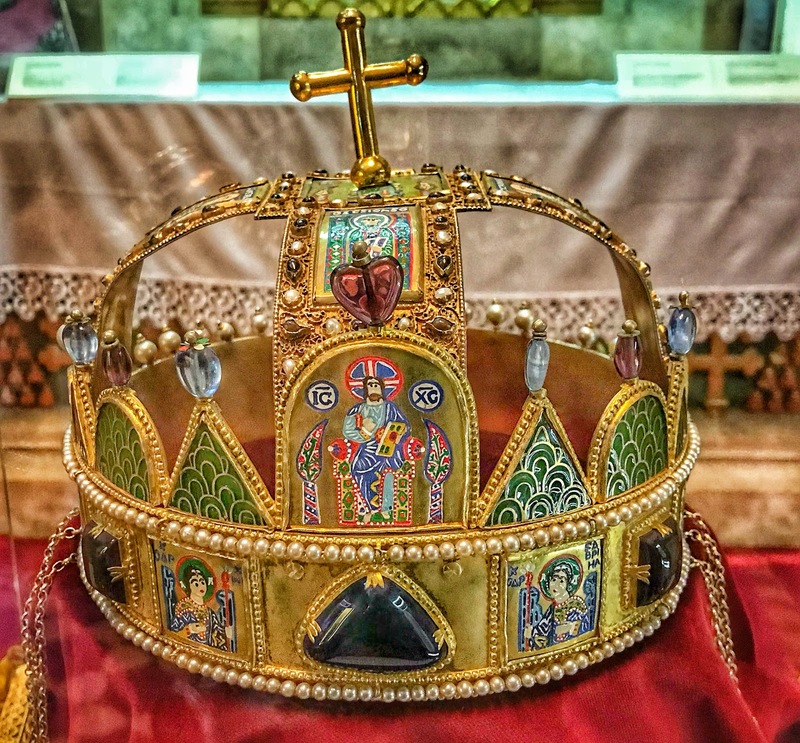 After almost 500 years of struggle, the Kingdom of Hungary finally succeeded in expelling the Bulgarians. Hungarian rulers built Buda Castle and fortress, completed in 1247, high on a hill in Buda, which was designated capital of the Kingdom of Hungary in 1361. The city of Pest developed on the mostly flat lands across the Danube, becoming a thriving economic and cultural center in its own right. Though the two cities were so near, their union was not feasible until the first permanent bridge was built across the Danube in 1849. 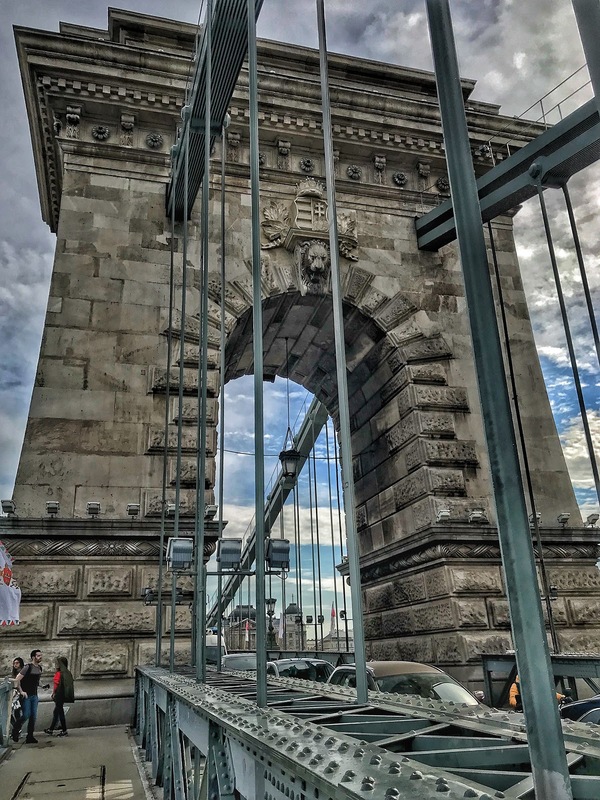 Considered a marvel of engineering when it was built, the Chain Bridge led to the eventual merger of Buda and Pest in 1873. It was inevitable that the bridge became a symbol of the city. Rolling into Budapest early Wednesday afternoon, we hopped off the train and checked the Uber app for a ride to our hotel. 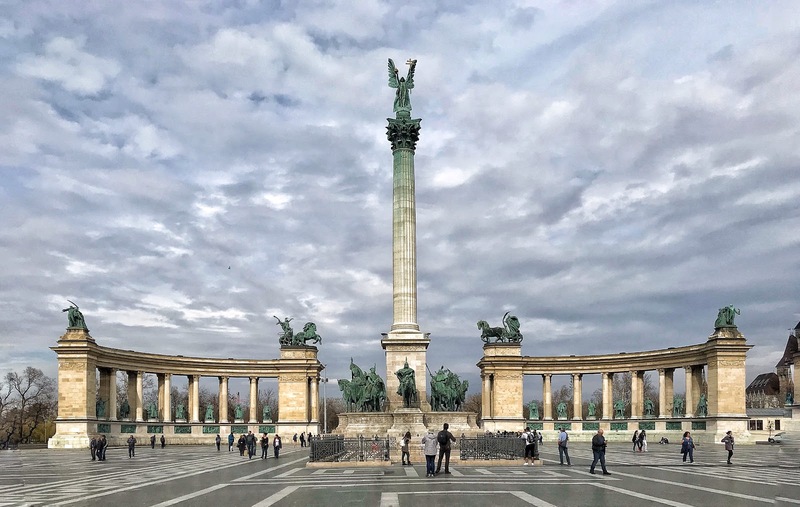 As we had suspected, the US-based ride-sharing service has been suspended in Budapest as it was in Bratislava and other European cities due to the efforts of the taxi industry. So we were back to Taxify. Traditional taxis were sitting in front of the station waiting for fares, but we've become too accustomed to advance knowledge of the fare to offer a cabbie the opportunity to jack up his meter with nonsensical wandering en route to our destination. 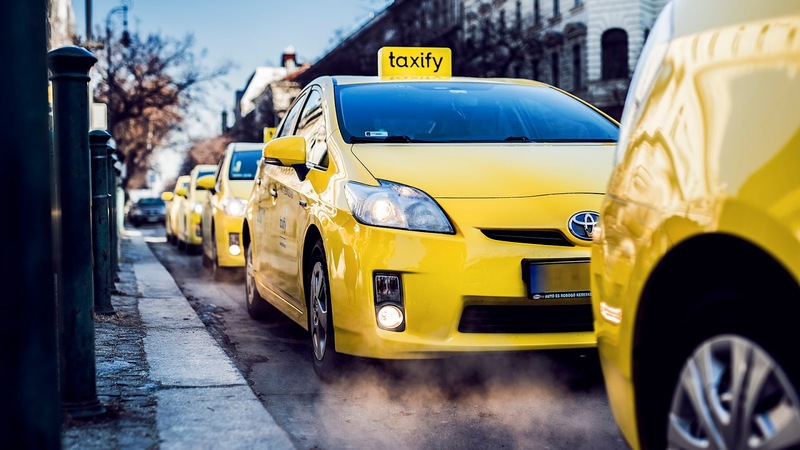 After our Taxify experiences in Bratislava were so similar to Uber (private individuals driving their personal cars), we were surprised when our ride showed up in a very traditional looking yellow taxi, complete with a meter. Our concerns about common taxi rip-offs were unfounded with Taxify, and the fare was a very reasonable 2,200 FT (Hungarian forint). The number is a bit off-putting at first until you conduct a currency conversion and realize you're paying only $8.00 for a 20-minute taxi ride. After checking in at the Hilton hotel on Castle Hill, we grabbed a bite of lunch in the hotel cafe and set out in search of a bank to make a withdrawal in the local currency. 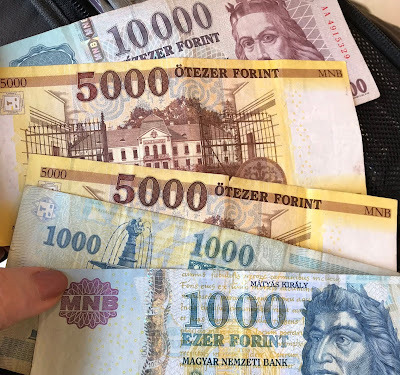 Although the taxi fare had us somewhat prepared, withdrawing 25,000 forint felt very extravagant, even though it was equivalent to less than $100. We're just not used to seeing that many zeroes on the currency in our wallets. 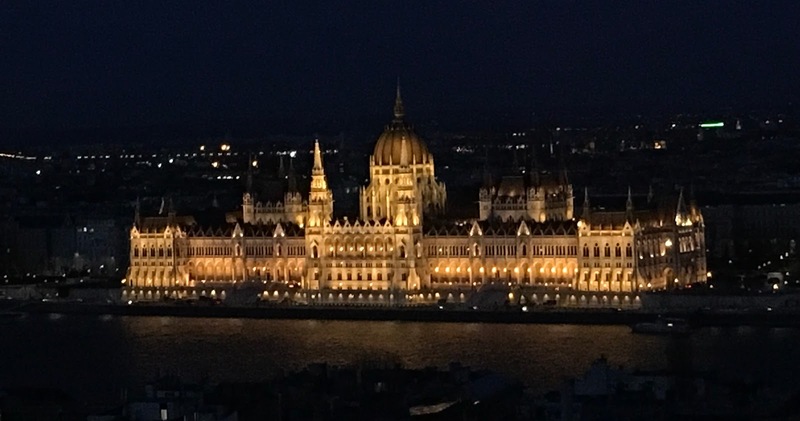 The Hilton hotel sits atop Castle Hill, some 1,400 feet above the Danube River. 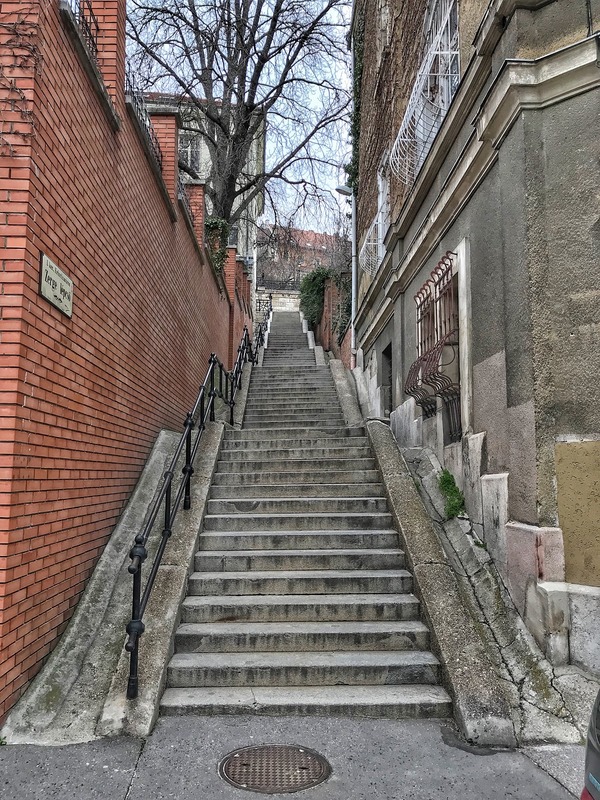 To find an ATM machine at a bank, we had to walk down the hill, much less challenging than getting back up on some of the many steps leading up the hill. Back at the summit, we walked to Matthias Church next door to our hotel. This Gothic version of the Roman Catholic church was built in the late 1300s, replacing the original Romanesque design completed in 1015 (and destroyed by Mongols in 1241). 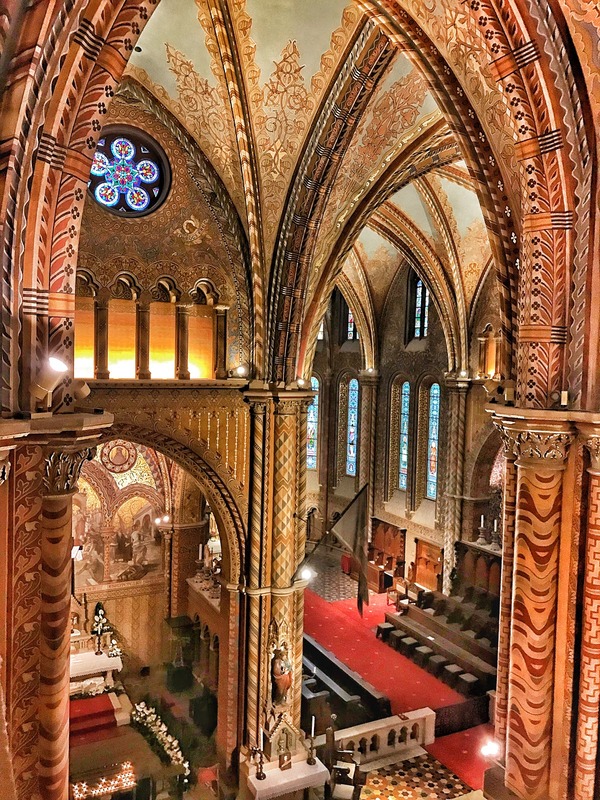 Despite its grandeur and history of hosting coronations of Hapsburg kings, Matthias Church is but a lowly parish church, the cathedral being across the river in Pest. 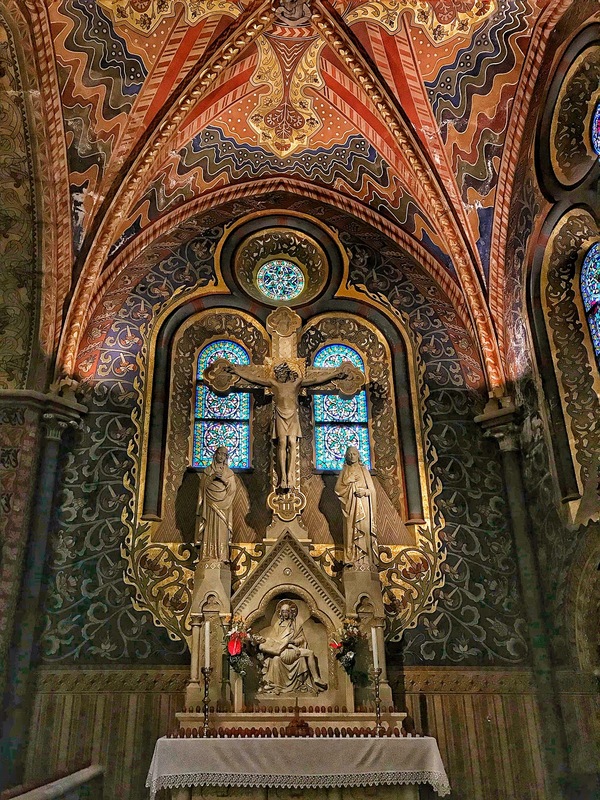 During World War II, Matthias Church suffered significant damage when German forces and later Soviet troops camped there. Between 1950 and 1970, the church was meticulously restored and renovated with funding by the Hungarian government. 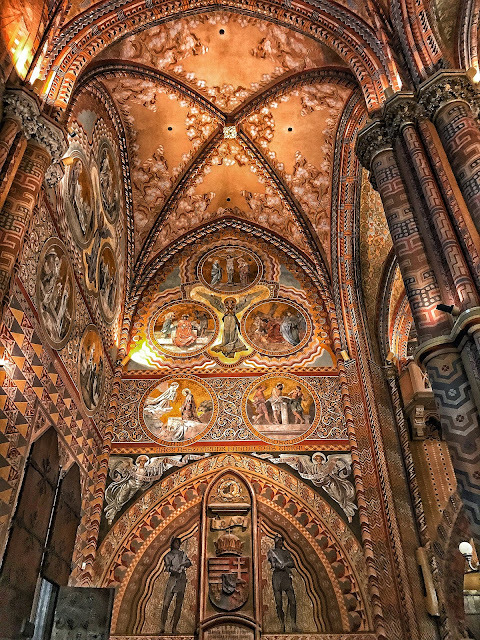 More recently, from 2006 to 2013, the interior's brilliant frescoes were brought back to life by painstaking artists. The glorious Matthias ended our sightseeing for the day, and we returned to the hotel for dinner before retiring to our room to enjoy the superb view of the Hungarian Parliament across the Danube in Pest. Though the weather forecast promised rain, we were thankful when it never materialized on Thursday. 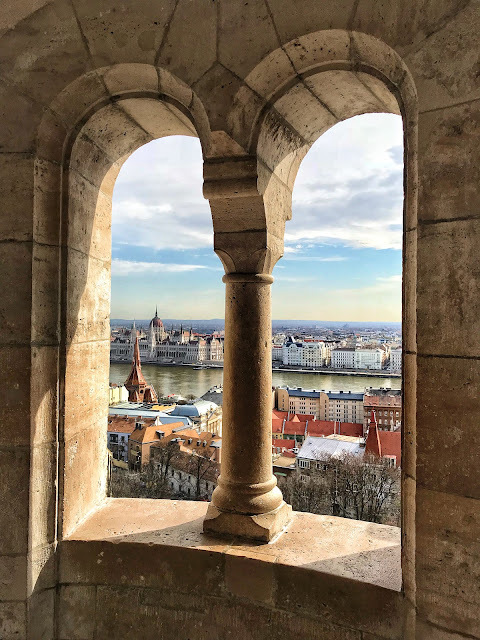 Our day began with Fisherman's Bastion, a neo-Romanesque terrace built on Castle Hill around Matthias Church near the turn of the twentieth century. 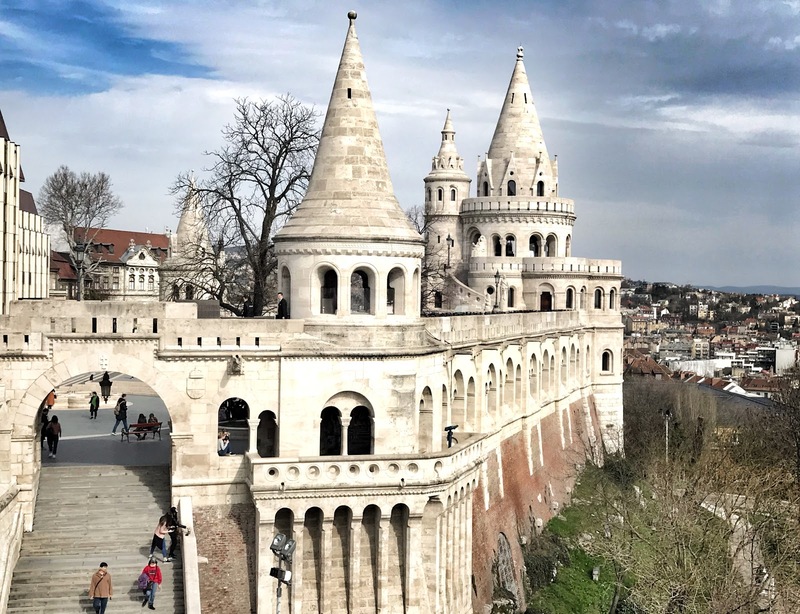 It resembles a gigantic sand castle and functions as a magnetic draw for tourists with stunning views across the Danube to Pest. Setting out on foot downhill, we made our way to the venerable Chain Bridge and walked over to Pest. As we crossed, we got a good look at some of the many river cruisers that ply the waters of the Danube. Built to fit through locks along the river, most of these unique boats are about 600 feet long but no more than 40 feet wide. River cruising in Europe has seen a rapid growth in recent years, with a large portion of passengers coming from North America. River cruisers this size carry about 200 passengers. On the opposite bank, we soon found a convenient spot to walk down a set of steps to river level. 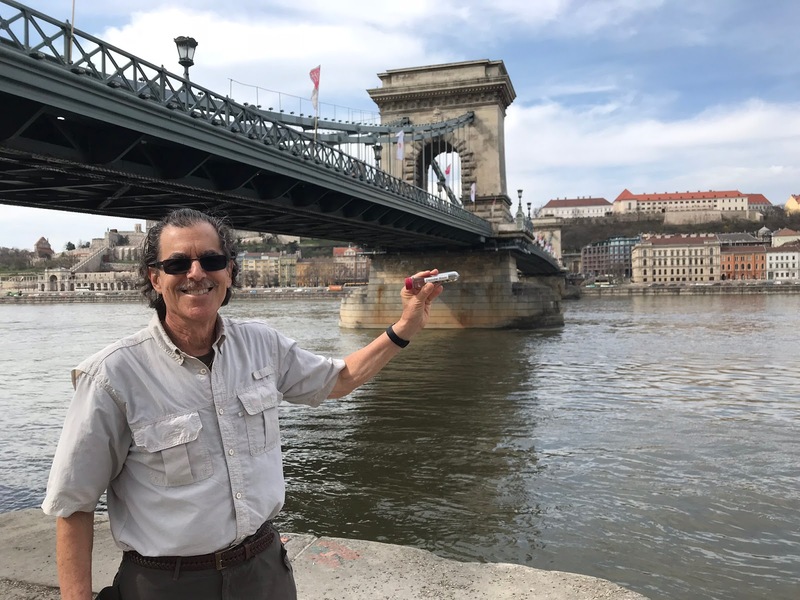 There we collected a sample of the Danube River for our "waters of the world" collection, though we still have no idea what we'll do with these tubes of well-traveled liquids. Strolling along the Danube Promenade toward the magnificent Hungarian Parliament building, we passed the poignant 'Shoes on the Danube Bank' memorial to victims of the brutal Arrow Cross. 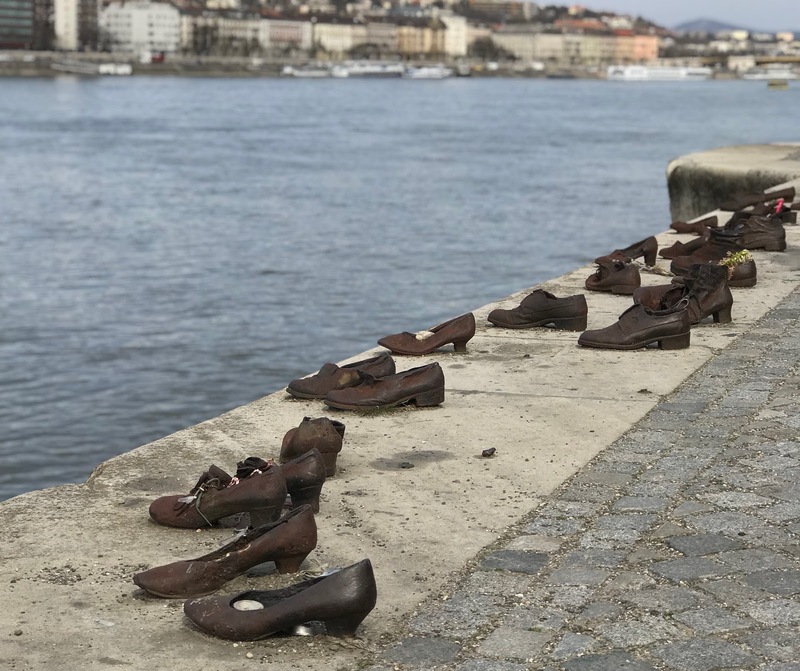 These fascist Hungarian militiamen lined up victims along the bank, told them to remove their shoes, and cold-bloodedly shot them, the bodies falling into the river to be swept away. From December, 1944 to January, 1945, the Arrow Cross took as many as 20,000 Jews to the river bank and executed them. Many of the shoes held votive candles or flowers that visitors had placed there, and a nearby sign explained the purpose of the monument. Neither of those facts convinced a few tone-deaf tourists who sat on the bank and took pictures of their own feet in the photo among the metal shoes of the memorial. 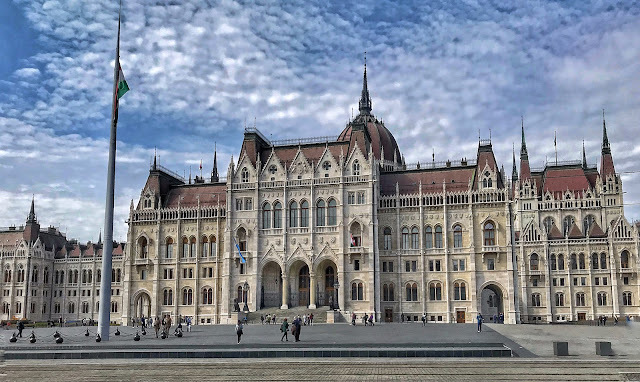 Since we had not reserved a spot in an English-speaking tour inside, our visit to the neo-Gothic Parliament building was limited to admiring its spectacular exterior. 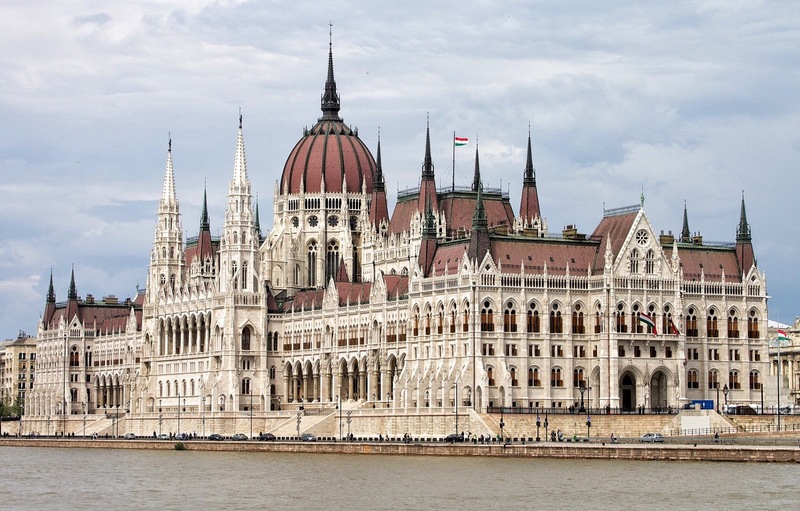 In 1880, the Hungarian government announced a design competition for a majestic new legislative building suitable for the recently united capital city and reflective of Hungary's thousand-year history. The building should face the Danube River but have its main entrance on the opposite side. 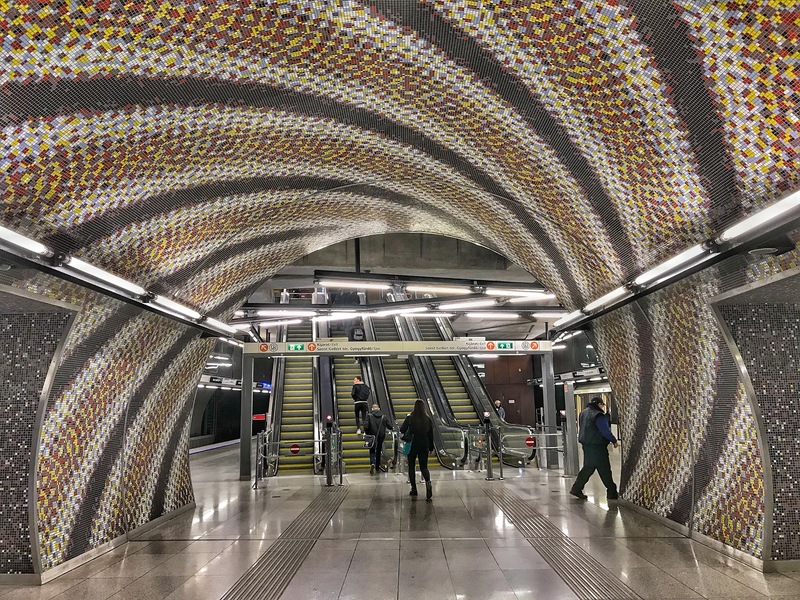 A Hungarian architect, Imre Steindl, won the commission, but sadly he went blind before construction was completed and never saw his design fulfilled. 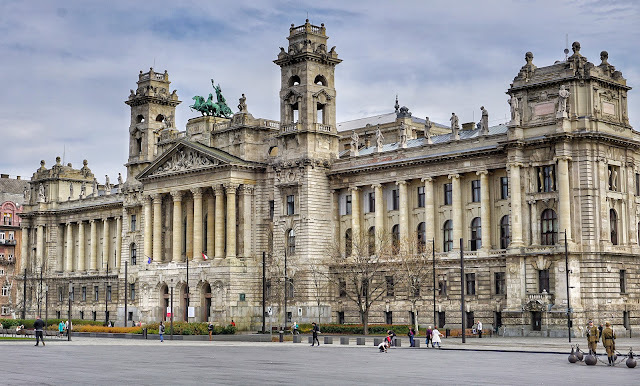 Two other favored designs were used for the Ministry of Justice building (now an ethnographic museum) and the Ministry of Agriculture building, both of which sit across a large square from Parliament. From Parliament, we strolled over to the only other building in Budapest which is permitted to be of equal height to the seat of the Hungarian government—St. Stephen's Basilica. Both structures stand at 315 feet tall, said to symbolize that neither the church shall reign over the state, nor the state over the church. Named in honor of Stephen, the first King of Hungary, the Neo-Classical basilica, which serves as the cathedral for Budapest, was constructed in the early twentieth century. Of course, we could not resist the opportunity to climb to the observation deck around the dome (especially when most of the trip was by elevator). One of St. Stephen's bell towers, as seen from the dome observation deck. It was only a short walk from the cathedral to Liberty Square. Along the way, we found lunch at a cute little vegetarian cafe. At the square, we marveled anew at the unflagging Soviet propensity to erect massive monuments to itself in the countries it subjugated. 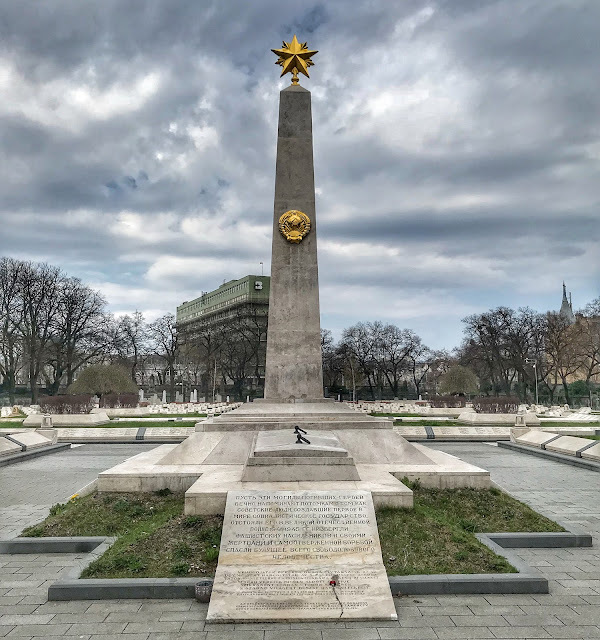 As usual, this Monument to the Soviet Red Army was said to celebrate the "liberation" of the local country from the Nazis in World War II. What we found especially fascinating was the presence of the US embassy in the shadow of the monument. 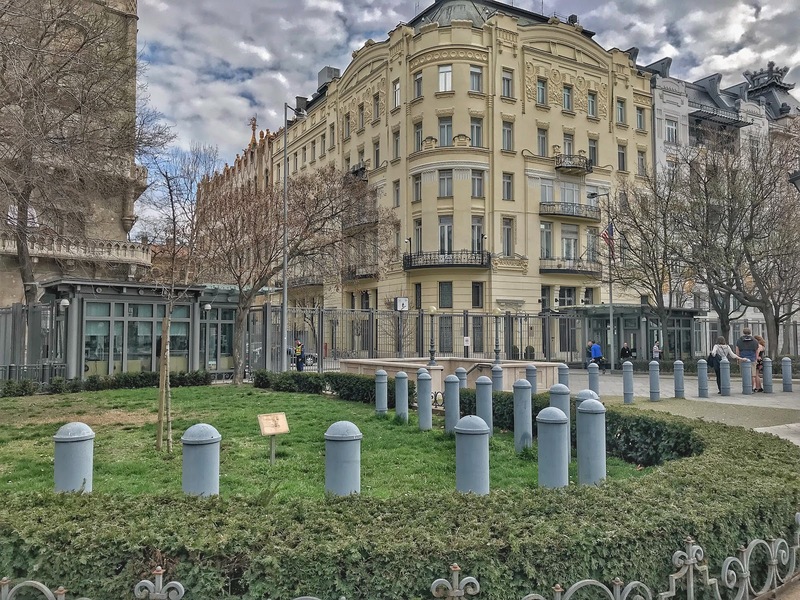 And what we thought was a fortress in Bratislava was like a Lincoln Log structure compared with the American compound in Budapest. Not only was the embassy surrounded by the standard nine-foot fence, three guardhouses were situated on the fence in the front of the building, one in back. Each was staffed with multiple employees. Beyond the fencing were a series of hundreds of bollards to block vehicles from approaching the building. Demands for tighter security around American embassies were prompted by assaults in Teheran (1979), Beirut (1983) and East Africa (1998). The 9/11 attacks and subsequent embassy incidents have only accelerated the fortress mentality. In contrast, the Russian embassy has only an unimposing fence, similar to others in its neighborhood with one small guard shack. No doubt, Russian security measures are reflective of the historical rarity of incidents involving their embassies. 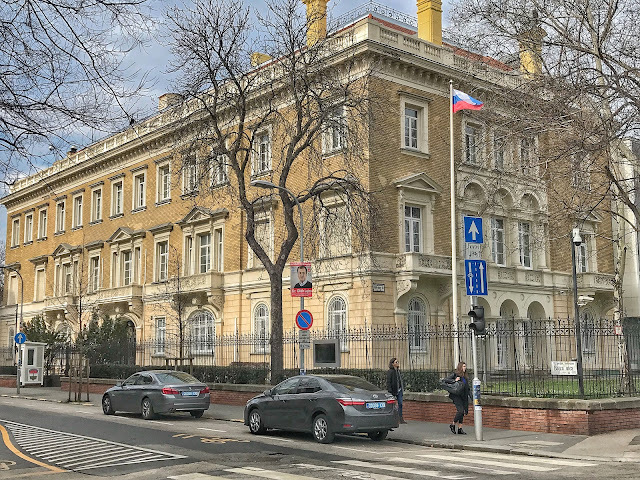 The Russian embassy is located on Andrassy Avenue, Budapest's elegant thoroughfare lined with spectacular neo-Renaissance mansions of late 19th century aristocrats and noble families. Andrassy connects the city center to City Park, and as it enters the park, the boulevard expands into Heroes' Square. 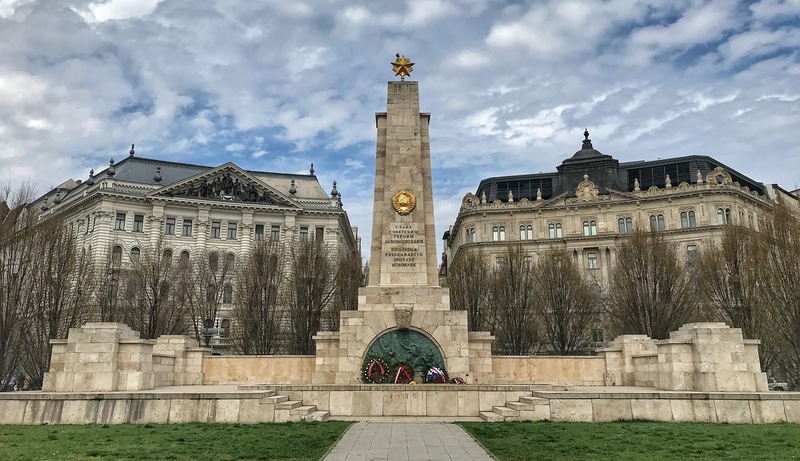 Imposing statues and monuments in the square honor the seven chieftains of the Magyars and other Hungarian national leaders. 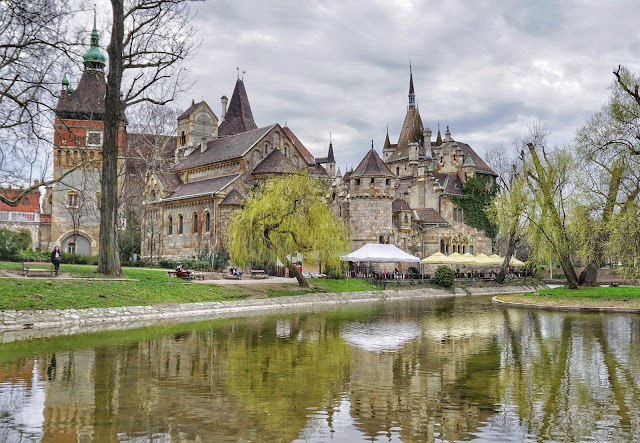 Just inside the park we were drawn to the eclectic Vajdahunyad Castle with its mix of architectural styles. Built for a Millennial Exhibition of 1896 celebrating the 1,000th anniversary of the founding of the Kingdom of Hungary, the temporary structure was built of cardboard and wood. 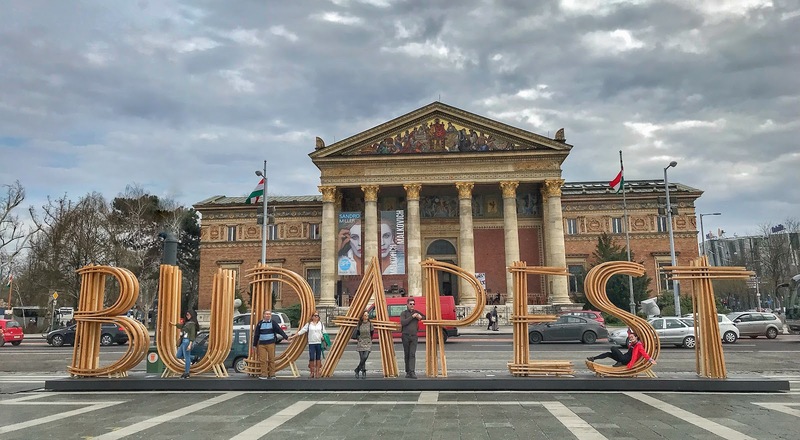 Featuring replicas of several landmark buildings from various parts of Hungary, it was so popular with the public that authorities later rebuilt it with stone and brick. Don't even ask his name. 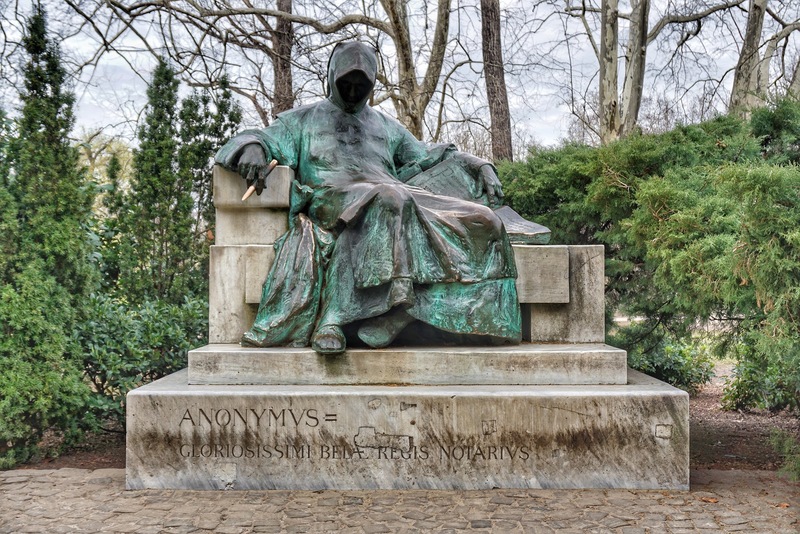 In the castle's courtyard sits an enormous statue of Anonymous, a notary and chronicler of a 13th century Hungarian king. He wrote a detailed history of Hungarian settlement in the Carpathian Basin, but his identity has never been determined. By the time we left the park, we had walked more than nine and a half miles and finally decided it was time to master the city's extensive public transit system. From a subway station at Heroes' Square, we took a train that transported us back across the river to Szell Kalman Square, one of the city's busiest transportation hubs. With buses and trams going in every direction, we had no difficulty hopping a ride that set us out in front of our hotel, exhausted. After our ten-mile marathon of sightseeing on Thursday, we were determined to ratchet down our schedule on Friday. 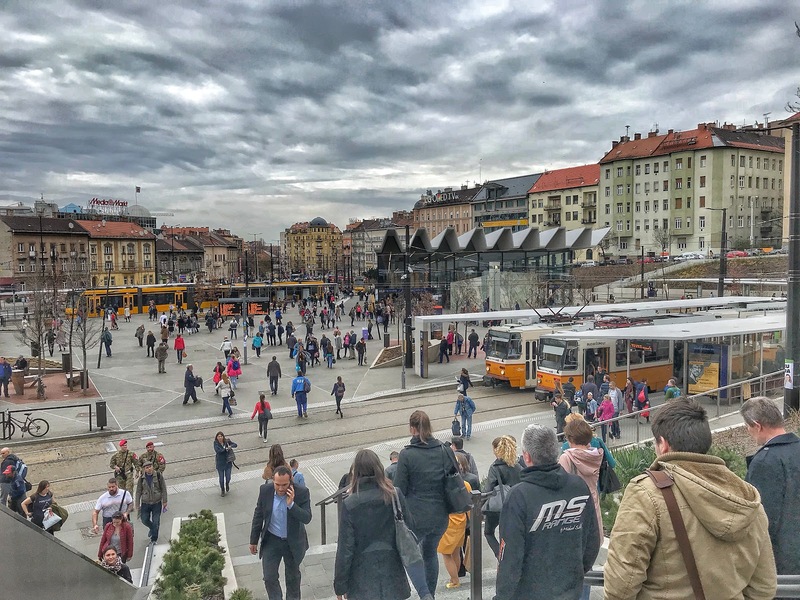 With our transit savvy, we caught a bus in front of the hotel to Szell Kalman Square, where we bought a 24-hour pass and hopped on a subway that deposited us near Kerepesi Cemetery. Not only is it Budapest's most famous graveyard, with dozens of Hungary's famous citizens interred there, Kerepesi also hosts a letterbox, hidden there by a California letterboxer. We found the box readily enough, stamped in, and decided the cemetery was sizable enough for another letterbox. Near a large section with graves of Soviet soldiers who died "liberating" Hungary from the Nazis, we found just the place and hid a letterbox of our own. Never ones to pass up the opportunity to remind local citizens that they "saved" the country from Nazis, Soviet authorities had planted yet another monument to the Soviet Red Army in the cemetery, similar in design to the one in Liberty Square. Back at the subway station, we were about to board another train for our next stop. Though the warning bell was sounding, I thought I still had time to enter the train door. I was wrong. 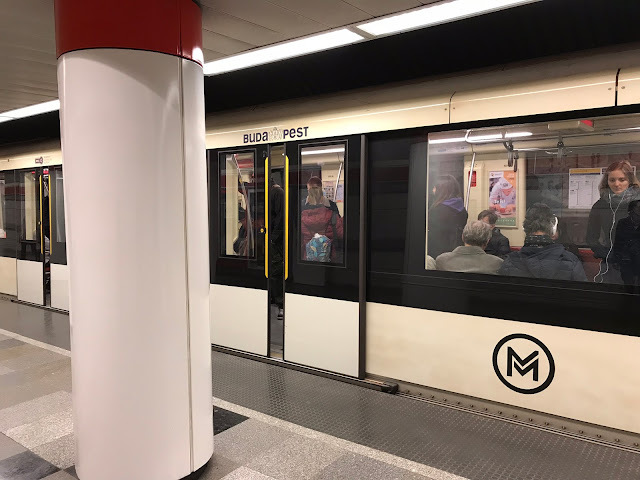 And rather than using an infrared beam to "see" that someone was between the doors as they were about to close, the Budapest subway train has to "feel" the human obstacle, resulting in a colorful bruise on both my arms. Since Ken was behind me, I decided to step out and wait for the next train after being bitten by the Jaws of Budapest. 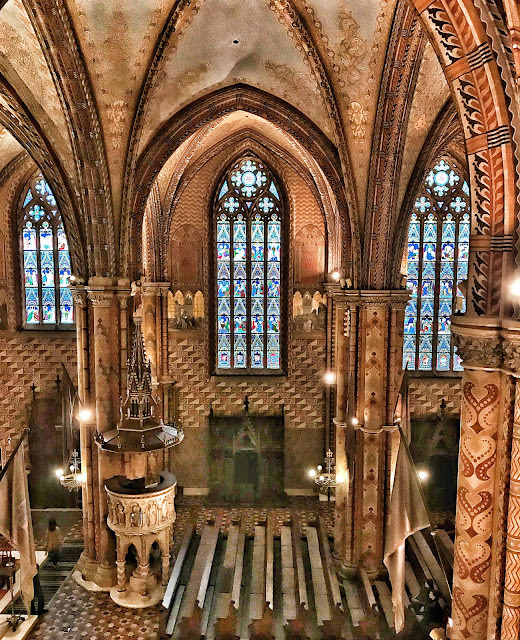 Our plans to visit the Dohany Street Synagogue, the largest synagogue outside New York, were foiled when we arrived and learned that it was closed Friday and Saturday for Passover. 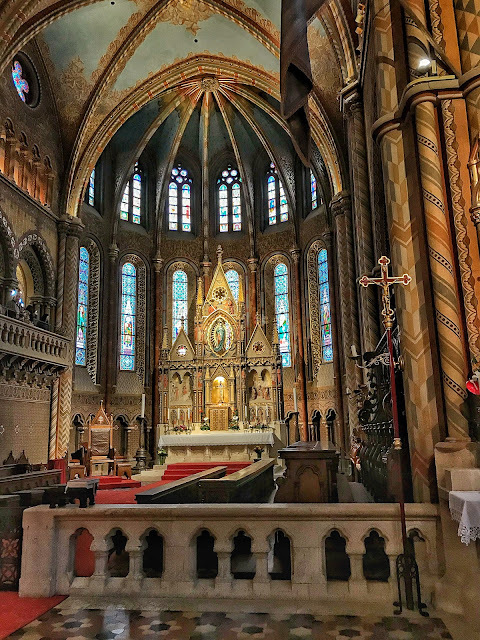 Fortunately, we had visited the beautiful sanctuary on our previous trip to the city. As we traveled through Budapest's subway system today, our experiences brought home the seismic changes in the city since our 1985 visit. Not only are the trains and stations themselves modern and bright and inviting, we were approached by a young local woman who saw us looking at our map and wondered whether we needed help. She works at a folk art gift shop in the heart of the city and chatted happily with us until we reached her stop. By Friday evening, our decision to throw caution to the wind regarding food in Budapest came back to bite Ken, as he experienced some mild stomach issues. Thankfully they didn't rise to the level of his Casablanca misery, but were sufficiently uncomfortable to convince us to take a day off from sightseeing on Saturday. A relaxing day was just what we both needed to prepare us to take off tomorrow morning for Romania. We'll fly to Cluj-Napoca in northeastern Romania for a couple of days before taking a driving circuit in the area. 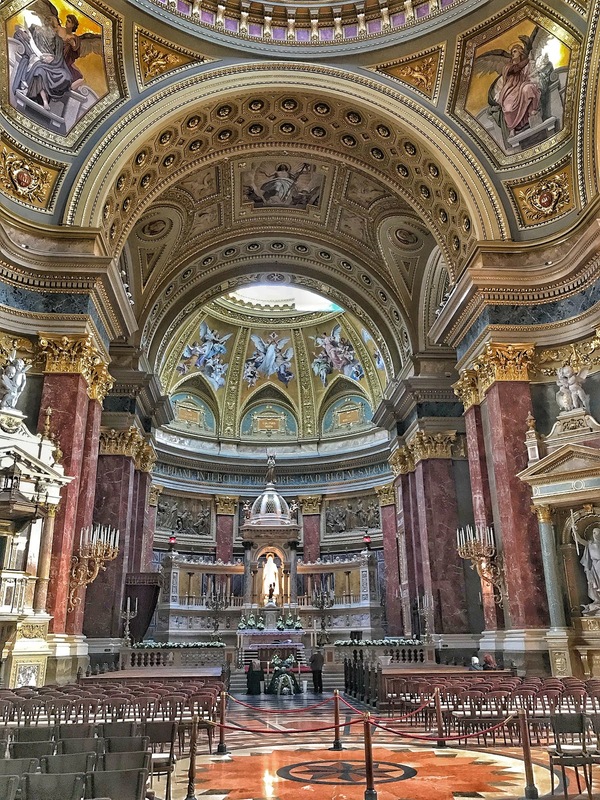 Loved: Seeing the incredibly positive changes in the people and places of Budapest since our 1985 visit. Lacking: Maybe a bit of common sense on our part regarding the CDC warnings about food safety. Learned: That we really, really like Budapest. Like Vienna, it is replete with amazing architectural masterpieces. One could spend a month here and still not see all its jewels. Fisherman's Bastion arches frame views of Pest. 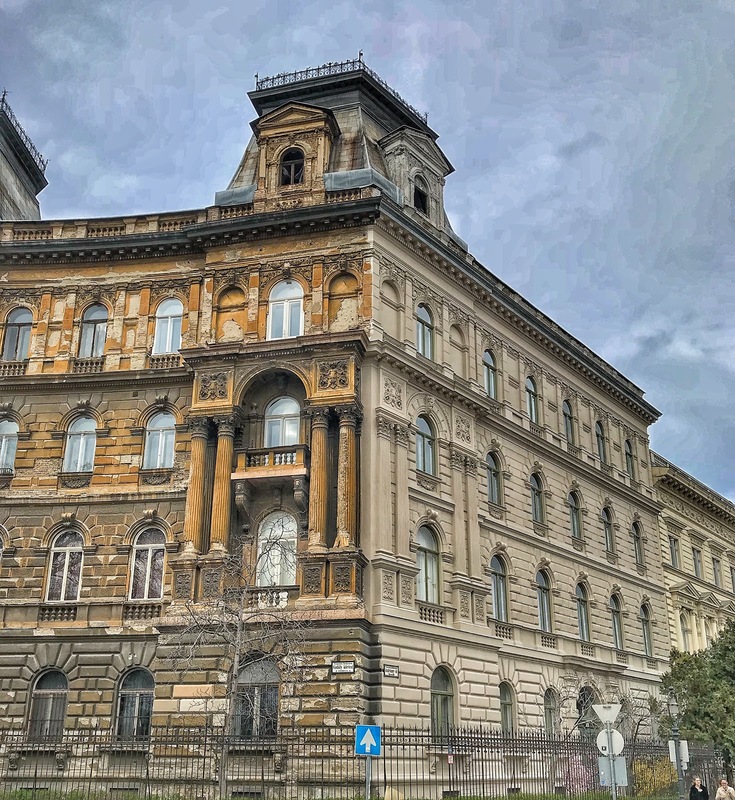 On Andrassy Avenue, a mansion with one face restored, one neglected. Temporary Spring Festival exhibit is a popular photo op spot in Heroes' Square. 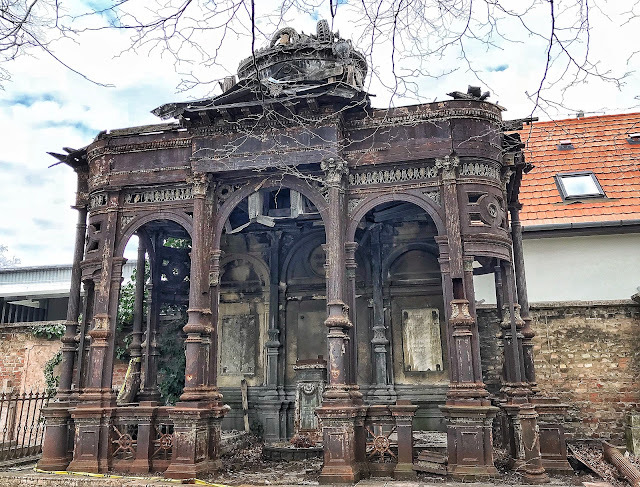 An iron monument at Kerepesi Cemetery must have been gorgeous when new, now rusted and collapsing.